ST. GEORGE’S, Oct. 10 (ChinaMil) -- The Chinese naval hospital ship Peace Ark (Hull 866)，currently on its "Harmonious Mission 2018"，have left for Dominica on October 9 after completing visit to Grenada. The Peace Ark left the St. George's Port at around 10 a.m. on October 9. A farewell ceremony was held by the Grenadian side for the Peace Ark. The Grenadian Health Minister Nickolas Steele, Chinese Ambassador to Grenada Zhao Yongchen, together with Chinese embassy staff, overseas Chinese, and representatives of Chinese-funded institutions saw off the Chinese hospital ship at the port. The Peace Ark arrived in St. George's on October 2 for an eight-day friendly visit and providing humanitarian medical service. This is the second visit of Peace Ark to the country since 2015. 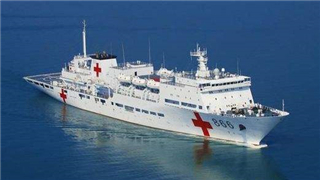 During the visit, the Chinese naval hospital ship took measures such as advance patient screening and joint security check to provide effective medical services. The Peace Ark also sent 11 medical teams to various local hospitals, communities, youth sports centers and national prisons to provide medical services at the same time. A Chinese medical team consisting of medical staff of several departments reached Carriacou Island for a two-day medical service in an effort to help as many people as possible. The Peace Ark has completed treatment of 7,275 person-times, as well as CT, DR and other auxiliary examinations of 2,764 person-times this trip. They also carried out physical examinations for 49 people, admitted 17 people into hospital and performed 15 cases of surgery. The Chinese medical experts also carried out the nursing technology demonstration exchange with 40 Grenadian nursing staff and demonstrated such skills as “bone marrow aspiration” and “neonatal touch”, receiving praise from the Grenadian side. On behalf of the Grenadian government and Grenadian people, Steele expressed their deep gratitude for the Peace Ark’s revisit. He said the Peace Ark brought health, peace and cooperation, which is what the Caribbean needs and what the people of the world expects. The relationship between the two countries will become a role model for the development of relations among countries. Zhao Yongchen said that amity between people holds the key to sound relations between states. The Peace Ark travelled far to revisit Grenada in order to build a bridge of friendship between the two nations. The visit has become another good deed praised far and wide in the history of friendly exchanges between the two countries. It also made the bilateral exchanges and cooperation more effective and lively, added Zhao.